Dreamlink T2 5G Dual Band WiFi model will comes with a Built-In WiFi antenna 600 Mbps which will free up the space on the USB port to be used with some other device. The build in antenna of 600 Mbps will be 4 times as fast than the previous model. If you still need more speed Dreamlink T2 5G Dual Band Built-In WiFi will be compatible with Dreamlink W3 wifi antennas. Dreamlink T2 5G Dual Band was designed to bring back the balance between Kodi (the most popular media center ) and the IPTV part of the unit . We have worked hard to offer not only a set top box with Android Operative system but to offer the latest one, Android 7 Nougat. Android Nougat presents itself as one of the most important upgrades. New features and over 250 improvements make this operative system more customizable, efficient, and safe. All this is excellently made by Dreamlink T2 to offer you endless amusement. Of course, we did not leave the good things behind; the Google Play Store will continue offering you countless applications. 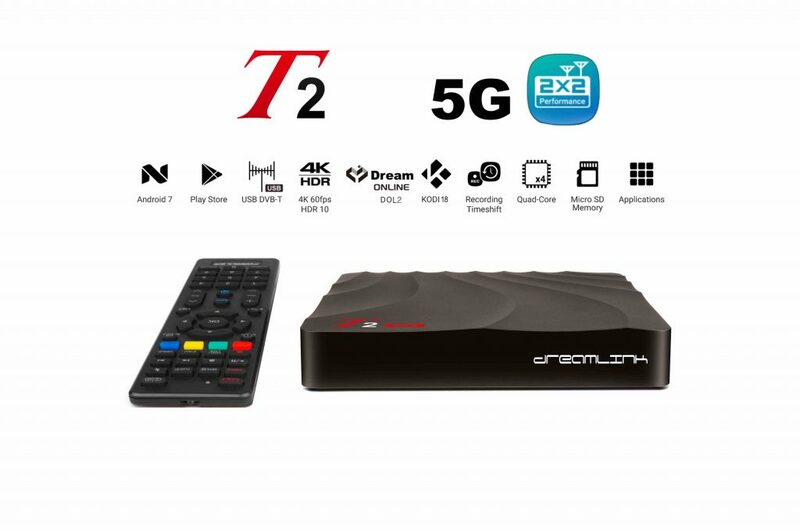 Dreamlink T2 5G Dual Band is the first IPTV set top box to contain the newest decoding technologies mixed with streaming media attributes including the already well-known DreamOnline. Dreamlink T2 5G Dual Band 600 Mps keeps the previous menu options and styles from the previous model. If you have owned a Dreamlink T1, you will find Dreamlink T2 5G Dual Band IPTV Set Top Box very easy to set up as the previous unit; so you do not have to learn a box all over again. Our continuous improvement system will amaze you. Every time there is a new enhancement, updates will be released to keep you running smoothly. Yes the future is here. Dreamlink T2 5G Dual Band with 600 Mbps Build in WiFi will comes with artificial intelligence. T2 will learn your habits and act upon them; over time it will interact with your entertainment equipment like Smart TV or Smart Home Theater to make your live easier. You will find that once it is turned on, Dreamlink T2 will also turn on your other devices for you; that way knowing you are ready to watch something. Catch Up TV function. Watch previous shows in the Electronic Program Guide (EPG). Record and Timeshift the on-screen program simultaneously. New trick-mode playback. Fast-Forward, rewind:x2, x4, x8, x16 speed. Note: Recording features are subject to source and availability. Dreamlink T2 with 300 Mbps Build in WiFi will be compatible with AirSync App for Dreamlink T2 or higher models. Once you install it, you will be able to use any android mobile device like your Phone or Tablet as Remote Control, Game Joystick, or simply to mirror the content in your mobile device. Enjoy a huge range of content, including over 2400 free TV channels including movies, sports, games, radio, and more; all of these with the fully optimized channels library from Dream TV pro. Easy set up, just plug it into an HDMI port on your TV, connect it to your WiFi network, and start casting. Dreamlink T2 5G Dual Band IPTV Set Top Box Smart TV has super fast channel switching, opposite to other IPTV boxes; this is the result of Quad core Mali450 processor’s high speed. Constant support. Dreamlink T2 plus and also DOL will update themselves every time there is new software available. This is a good thing because you do not have to spend time looking for updates. EXTERNAL USB SUPPORTING TIME SHIFT AND ALSO LIVE RECORDING OR PLAYBACK. TRUE PVR FEATURES AS TIMESHIFTING, INSTANT RECORDING, AND ALSO RESERVED RECORDING. GOOGLE LOG IN AND IN ADDITION GOOGLE APK STORE FOR ALL KINDS OF APK INSTALLATION. GRID EPG AND SIGNLE EPG SUPPORT MAXIMUM 14 DAYS. SUPREME ULTRA-HD LEVEL PICTURE QUALITY COMPARED WITH OTHER IPTV BOXES.